In this article we’d like to show you all of the new features and details about V2.0, that will be presented step by step over the next weeks. This one’s something for all of you but especially the ones that have own social media sites/pages or tend to show customers a lot of their work. You’ll be able to individualize the setplan exports by having your own logo on it or adding a title. You can even make notes on them – all of this will make people know exactly who created this lighting setup. But if you don’t want to add anything, that’s fine as well. 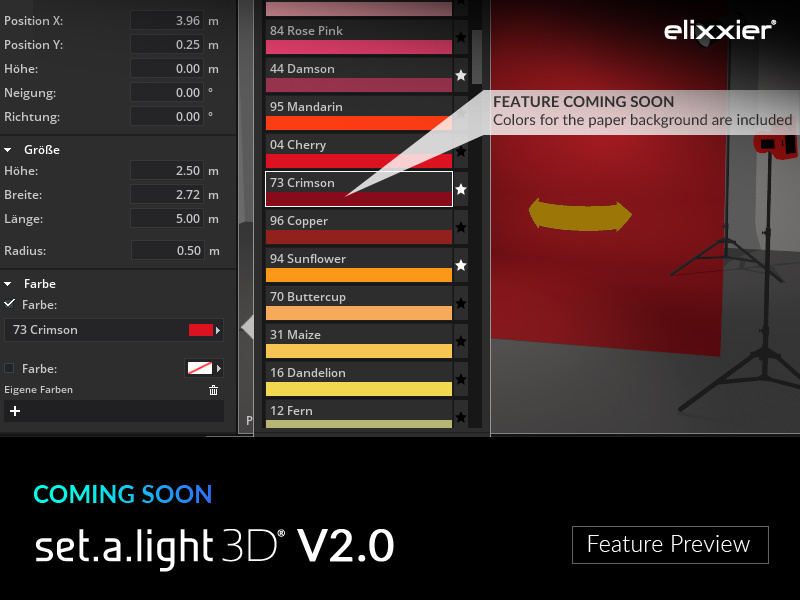 V2.0 will be even more extensive and comprehensive when it comes to interior. We added a big bunch of new furniture, reaching from sofas and chairs to tables and lots of other things. They’re not only more beautiful, but will help you to reconstruct your studio or living room etc. in detail. With the new gobo users can create patterns and shapes with the flash. Creating own templates, importing them and using them for your lighting design is possible with only a few easy clicks. The new gobo also allows zooming and focussing. From their individual fingers up to their head and down to the fett – everything about our models can be moved! V2.0 makes itt possible for you to bring them into any pose you like. Make sure to save the positions for later! Even their eyes will be able to face the light shaper or the camera with just one click. Later, it’s also going to be possible to make it look towards any point you like. We surely had to integrate a ring light! 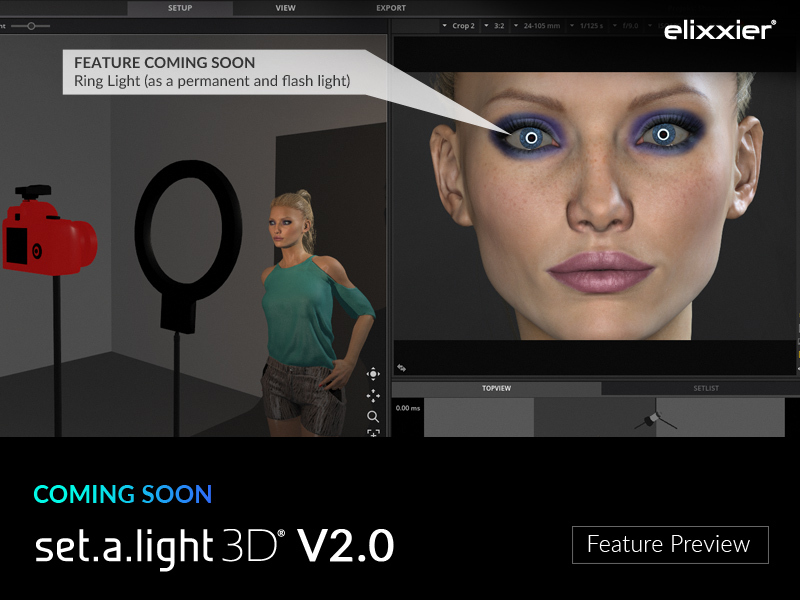 You can now use the typical ring light effect in your lighting setups – in can be seen with the round light reflections in the eyes of the model. It’s available as a permanent/continous light or as a flash light and gives you more options to get creative with your setups! White balance is a topic that’s really important to us. Finally, the color temperature is adjustable by setting its specific amount of kelvin in the new bar. You can make changes to the white balance directly at the camera and test the effects and the impact on your pictures. You can now easily work with several camers – that’s an important thing, especially for the video department, i.e. in interviews. In earlier times, you were able to set up more than one camera in the studio, but you couldn’t do anything with it, as it was more of a decoration-thing… This changes now! Switch your view between your cameras with only one click to check the lighting for all of your perspectives. And: you don’t have to strenuously move the same camera around all the time. Even more functions are now available in the quick-access of our setlist. This spares you having to switch between different windows/views. The displayed power of the flash head (in Ws) can be read off and adjustied very precisely, and shutting off the flash or changing to solo-mode is possible as well. Start making alterations or modifications directly at the flash or light shaper. 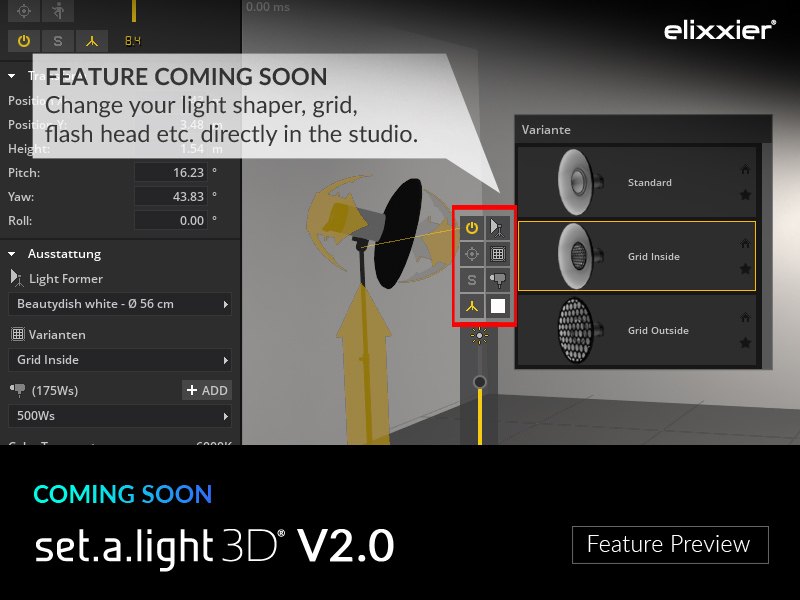 Change the light former/shaper, add a grid or swap the flash head – it’s so easy and just one click away in the revised settings panel! This is extremely helpful if you want to test the effect of diffeent light shapers or to change the color gel. And by the way, with only one more click you can now align/angle the equipment onto the model. Another great thing: Simply adjust the color of the paper background by choosing one of the many options that we’ve collected for you out of our menu. We integrated the real names of the two biggest and most important facturers (Colorama & Savage)! But you’ll of course also be able to come up with your very own color. Our new UI will make you work faster and more efficient. 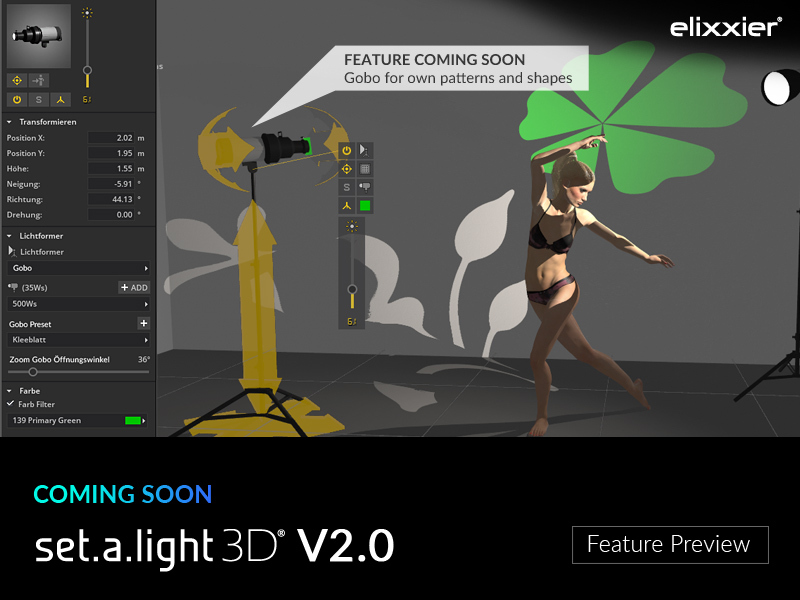 With a big number of smaller modifications it will adapt perfectly to your workflow and makes using set.a.light 3D even more intuitive. A big point is for example the ability to sort the content in the light shaper area with the new favorites. Come back here, there’s going to be more! 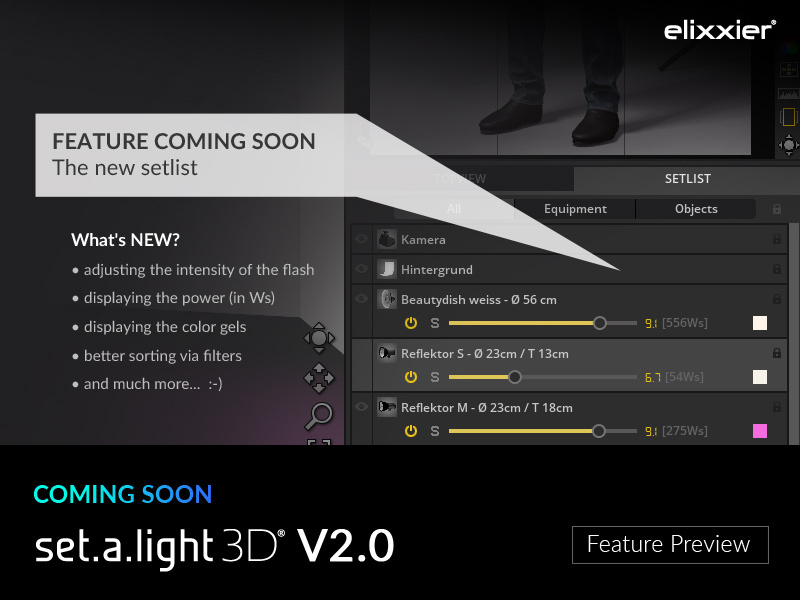 You’ll soon see more insights on the new version 2.0! 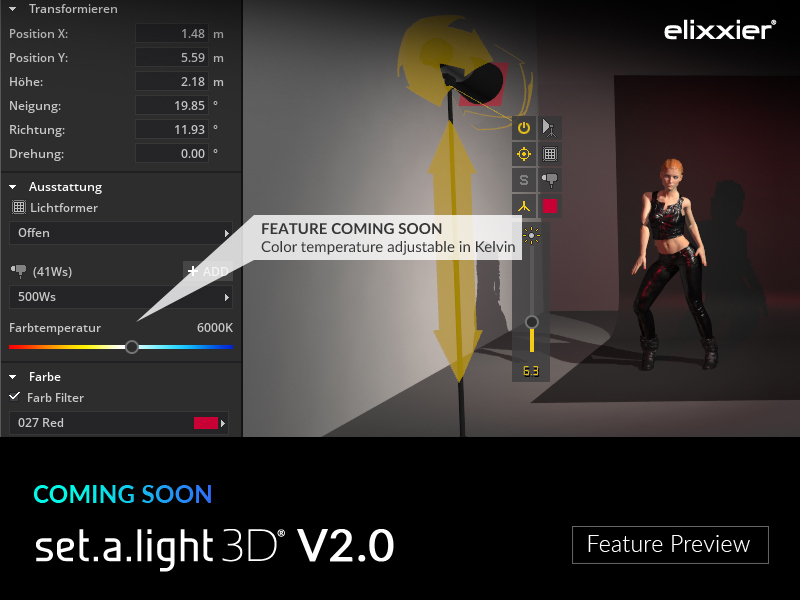 For example, we’ll soon be showing you some stuff on our movable models, that will let you plan your shootings even more detailed and more flexible. The new gobo is another thing that’s going to come soon. And YES, the will be permanent light – quite fitting, that you can then set the shutter speed of the camera. Even mixing flash and continuous light won’t be a problem! 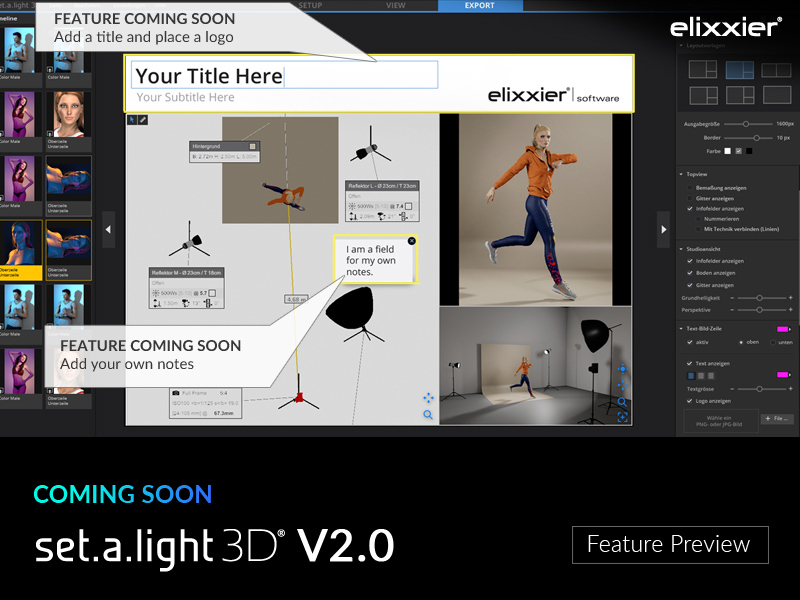 Our first announcement on V2.0 can be found here! 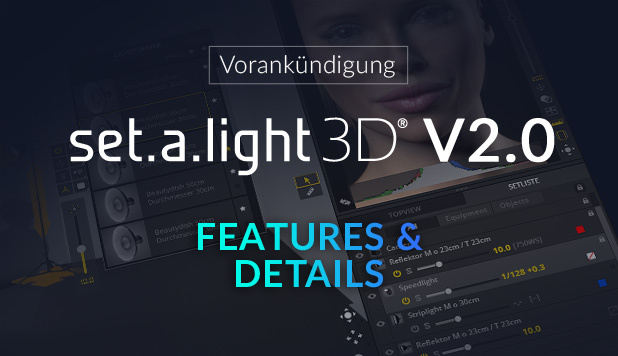 We’re developing every modification and every improvement in order to make your workflow even more intuitive and enhance your experience with set.a.light 3D. With it’s upgraded flexibility and simplicity we want to continue to encourage and support your creativity – all of that in the spirit of successful photoshootings and great images! 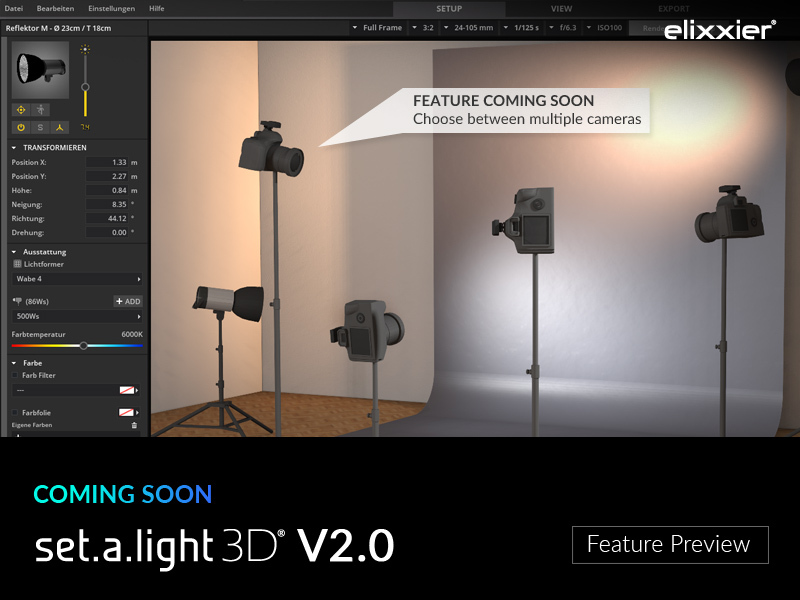 Previous: Huge package: 30 light setups bundle for you!